DNA Repair pathways in animal cells can be divided into two main categories: HR and NHEJ. HR or homologous recombination is a minor pathway but very important in protecting cells from genotoxicity. NHEJ, in contrast, is a prominent pathway in animal cells but is error prone in nature. A specific reporter based assay for NHEJ is valuable for anti-cancer drug discovery projects, learning more about the process of DNA repair and establishing intersecting pathways and druggable pathway targets. This kit contains reagents necessary to create a complete NHEJ reporter system in any animal cell line. It includes the NHEJ-GFP reporter with a selectable marker and a DS DNA cleavage nuclease to initiate DNA repair. 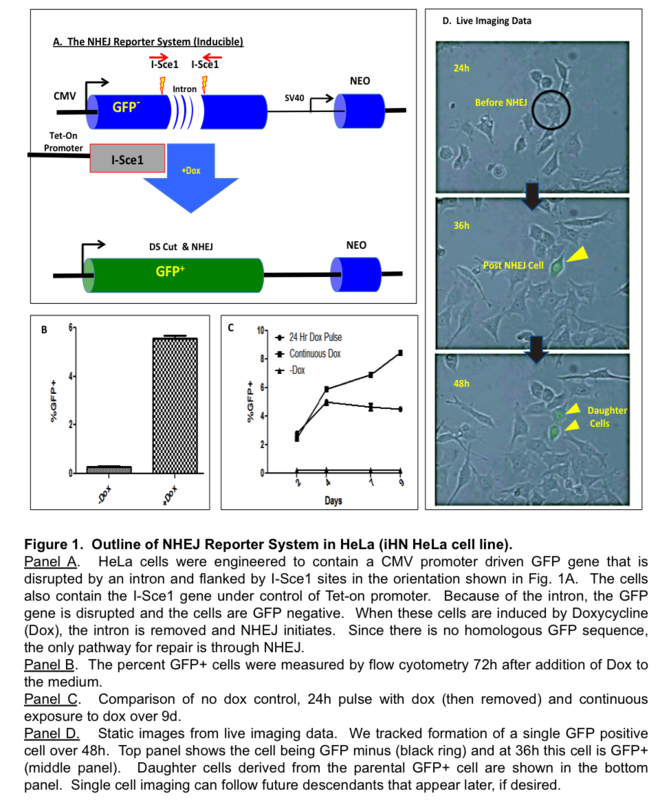 Because GFP is a neutral gene reporter and not subject to selection, DNA repair can easily be examined and assayed by assessing the %GFP or GFP intensity in a population of cells. The system is mobile in that it can put into any cell lineage (or other species) to adapt to the investigators system of study. The kit also contains a control cell line (iHN-HeLa) that has the NHEJ-GFP reporter and a Tet-on promoter for I-Sce1. NHEJ is conveniently activated by simply adding doxycycline to the media. It serves as a control line and will help the investigator establish his own unique reporter line quickly and efficiently. This system has been designed to allow researchers to examine and interrogate NHEJ in live cells, in real time. We designed this kit to allow the customer to place the NHEJ into a cell of his or her choosing. To illustrate how the system works, we used an inducible I-Sce1 gene in a HeLa cell line (iHN-HeLa, included in the Kit). In these cells, NHEJ is conveniently activated by inducing the I-Sce1 gene under a Tet-on promoter (Fig. 1A). The GFP-NHEJ reporter contains GFP with a disrupting intron that kills the gene and renders the cells GFP negative. The intron is flanked by two I-Sce1 cleavage sites. After I-Sce1 DS DNA cleavage, incompatible end configurations are formed which are repaired by NHEJ (HR is not possible since a homologous sequence is missing). The basic assay screens for GFP+ cells that form when NHEJ faithfully restores the wild type sequence (Fig. 1B). The induction of I-Sce1 by Dox is rapid and efficient (all cells will express); however, NHEJ takes place more slowly over a period of several days, and only a small fraction of cells repair the GFP gene in an fashion that allows expression of GFP. In addition, one can use single cell imaging to follow individual GFP+ cell clones over time. This allows one to track a progenitor cell (or the 1st GFP+ cell, see Fig. 1D) and all descendants at a single cell level, if desired. CONTROL LINE: iHN-HeLa Cells ready for culture in T-25 flask. These cells have the NHEJ-GFP Gene stably integrated into the genome. We recommend maintaining these cells in 200ug/ml G418. DR5000A-Custom-Sce Kits do not include this cell line. NHEJ-GFP plasmid (store at -20o or 4oC). DNA concentration is 0.5ug/ul (100ul for a total of 50ug). This plasmid has a G418 marker for selection. This is the NHEJ reporter plasmid that will be stably transfected in your cells of interest. pSCE1 expression plasmid (DNA concentration is 0.5ug/ul and 100ul for a total of 50ug). There are no selectable markers with this plasmid. This is the plasmid to be used in transfecting newly engineered cells of your choosing to initiate NHEJ in the cells. G418 (Neo) at 50mg/ml (1mL total). Replenishment available from Sigma. This kit may include a reporter cell line ready for culture and is shipped at ambient temperature. The cells can be stored at 4° C for no more than one week before plating. Other reagents should be stored at 4° C (short term) or -20° C (long term) upon receipt.